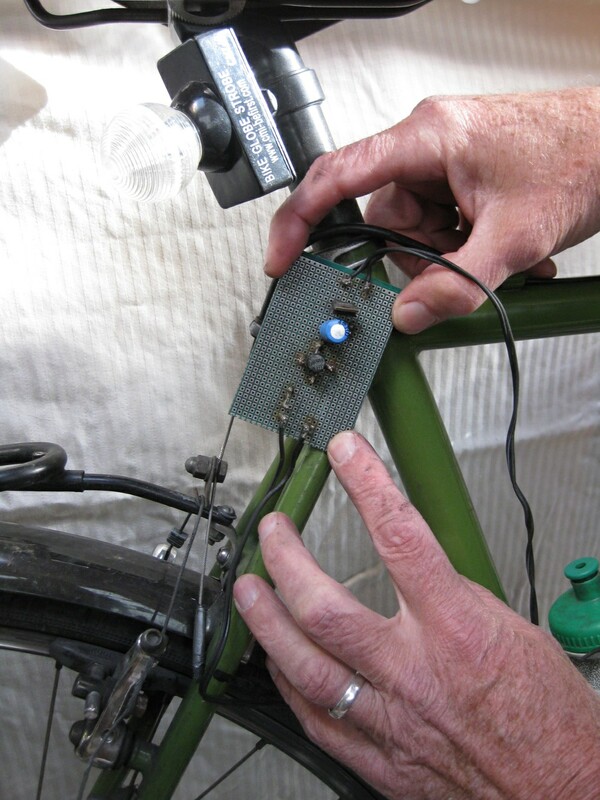 This winter, my dad and I took up the project of building a simple pedal-powered cell phone charger to mount on my bicycle. 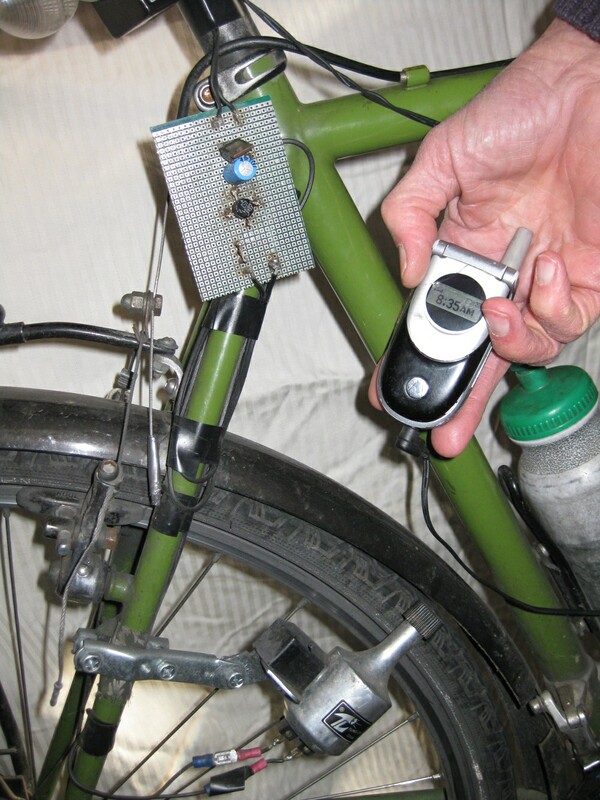 Cell phones are small potatoes in the big picture of energy consumption, but the apparatus we built could be a very practical concept for those on self-supported bike tours or those living temporarily in situations without electricity. Just unplug your phone from the wall, and in the time that it takes for you to rig up this gizmo your phone will be out of juice and you’ll be due for a long ride! A couple visits to the local hardware store and Radio Shack secured all the parts we needed for the job. Step 1: Mount the generator onto your bicycle as directed on the package. It will work on either the rear or front axle. I mounted mine on the rear. Cut the cord off of your cell phone charger. Strip the insulation from the cut end to expose about a half-inch of both the positive and negative wires. 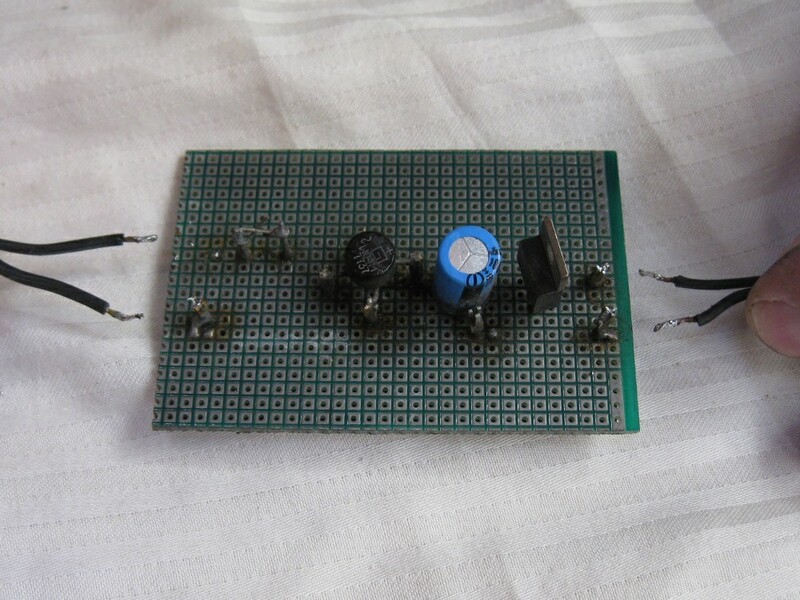 Step 2: Assemble the circuit, as shown below. 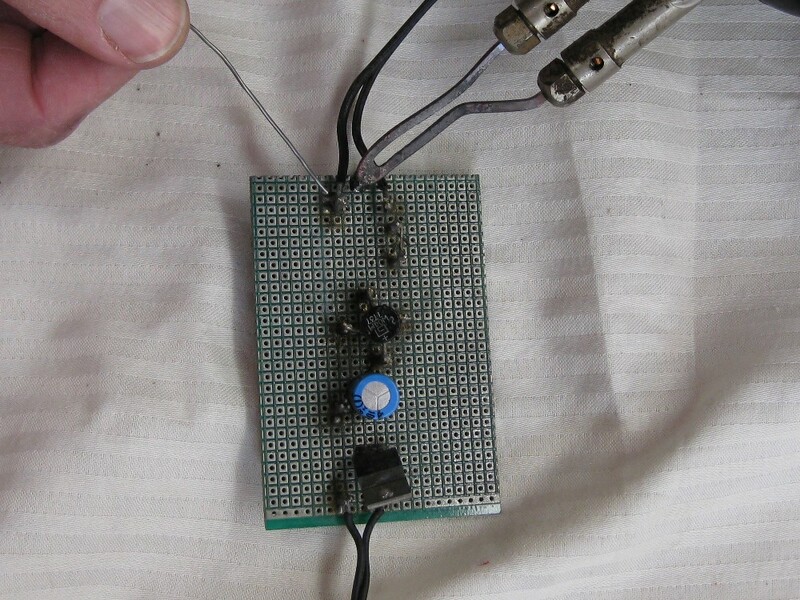 Push the wires from the components through the holes in the circuit board. Use mounting pins to connect to the electronic components when necessary, and connect from pin to pin with the hookup wire. Step 3: Solder the two cut, stripped leads from the cell phone charger to the mounting pins connected to the voltage regulator. The wire going to the center of the power jack is usually the positive/red one. Connect the wire coming from the generator to the AC terminals of the bridge rectifier. Check your work against the circuit diagram at the top of the page. 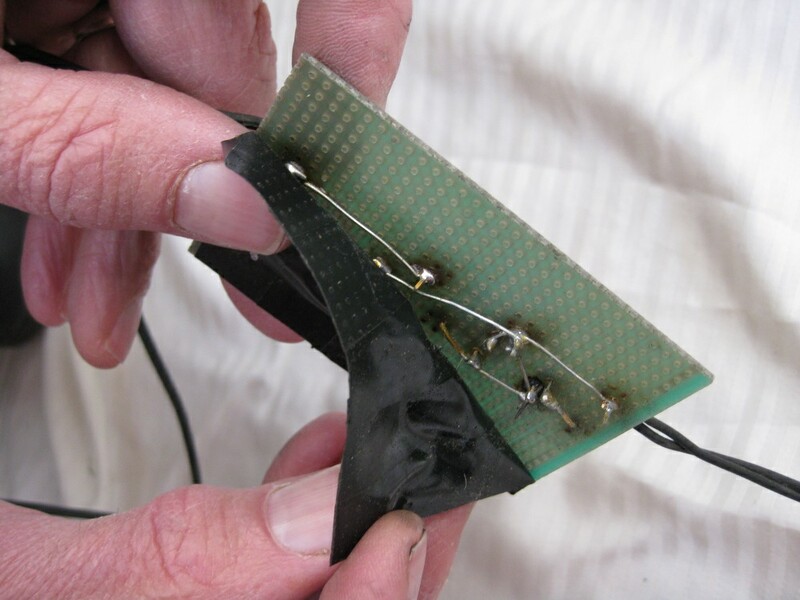 Step 4: Protect the solder side of the circuit board with a layer of electrical tape. This will help protect the circuit from shorts due to accidental contact with conductive material, and from exposure to the elements. Step 5: You’re almost ready to go. You only need to secure the wire to the frame of your bike with tape (or zip ties) and position the circuit board somewhere out of the way (we placed mine at the base of the seat post). Step 6: Where you place the charging cell phone while you ride is up to you. I keep a basket hanging from my handlebars, so I ran the wire along the length of the center bar of the bike such that the DC plug-in ended up in the basket, where the phone stays while I’m riding. 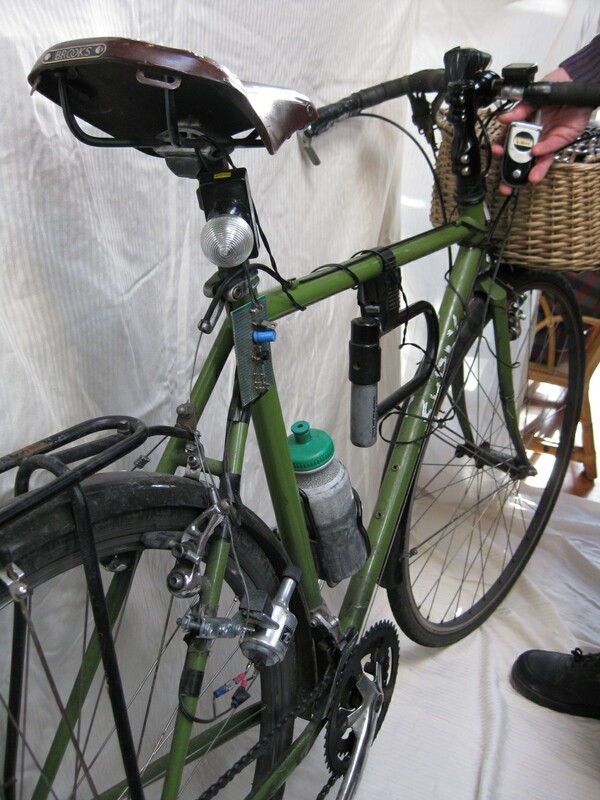 Other options are to keep the phone in a tool bag under the seat or in a saddle bag on the rear rack. Step 7: Plug in your phone and start pedaling! The phone should react just as if it were charging from a wall outlet. When engaged, the generator wheel rolls against the bike tire. The motion produces electricity, and the greater your speed, the greater the voltage output. The cord from the generator leads first to the circuit board’s bridge rectifier, which converts the AC to DC. In other words, the up-and-down, positive-to-negative current becomes a steady positive current. 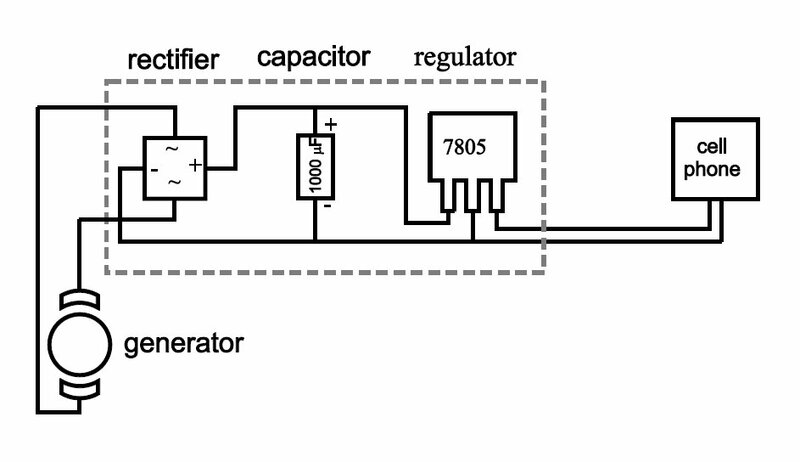 Then, the capacitor levels out the DC voltage, producing a steady voltage inflow to the voltage regulator. The voltage regulator is crucial, as the phone only needs five volts to charge, whereas fast pedaling can produce 30 volts or more, which is enough to fry the average cell phone. The regulator controls the voltage, putting a five-volt ceiling on the power entering the phone. Starting with a dead cell phone, plugged in and placed in my basket, I spent approximately three hours and 25 miles riding in the streets of San Francisco to charge it back to full power. Much to my surprise, an easy speed of only four miles per hour was enough to keep the power production at the necessary five volts, and almost as soon as I rolled out the door, the phone lit up and beeped, indicating that it had begun to charge. Even in stop-and-go city cycling, my speed rarely dropped below charging speed, allowing the battery to juice up almost continuously. The generator made riding significantly more difficult due to the friction of the roller against the tire, so you might want to disengage the generator on hard uphill climbs. Also, a lot of potential energy is wasted on long downhill runs, since voltage over and above 5V is lost as heat from the regulator. 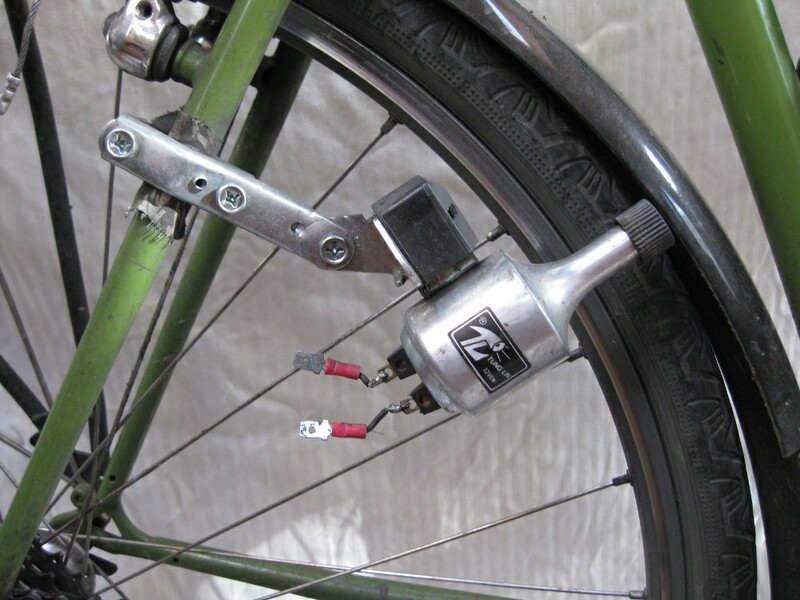 The system could be improved by installing a battery to catch and store the overflow energy for use when the output voltage drops below 5V, as when the bike is moving slowly or at rest. The cost of the system is about $25.00, and the incentive – even the necessity – to ride the bike daily helps keep you in shape!